Welcome readers to the last edition of the year 2014 here from Allora Gardens Nursery, another great year in the garden. New plants, new products so much fun to be had working in our Garden Centre and helping you with all your gardening issues. Happy morning teas and sing songs with our community groups, educating and tour groups with various schools not to mention our live workshops for all to enjoy…..
Allora Gardens has had the pleasure and good fortune of an amazing young lady Eliska Lisa from Chez republic/Praque for the last 5 months displaying and re arranging of our giftware section, train carriage gift shop and coffee shop area. 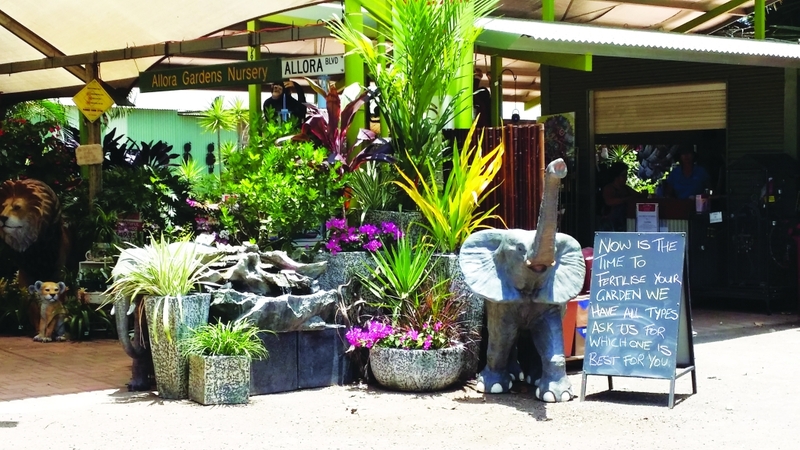 She is a wonderful addition to our amazing team here So if you are looking for that hard to buy for loved one we are the spot at Knuckeys Lagoon not to be missed..
With leather animals to life size animal statues, cats, dogs, crocodiles, chimpanzees, lions, camels and even zebras. Unusual mirrors as well as wall plaques with caring or comical words, even bar signs for that fun person in your life. White concrete pots and concrete statues at ½ price, and beautiful standard topiary plants to compliment them. If your cleaning up your backyard this Christmas holidays pop in and grab a rustic windmill or even a bridge to create a beautiful entrance to a different section to your garden. Lots to choose from, enjoy the ambience, a coffee and cake or just relax with a cold drink under our beautiful trees in the cool here.